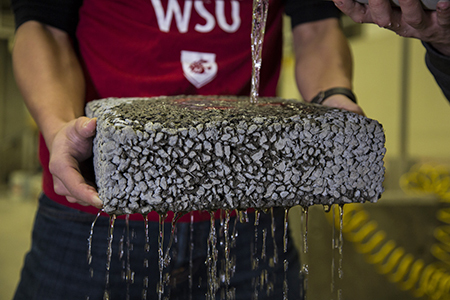 Water streams through WSU pervious pavement with carbon fiber in a lab test. Pullman, Wash. — A Washington State University research team is solving a high-tech waste problem while addressing the environmental challenge of stormwater runoff. The researchers have shown they can greatly strengthen permeable pavements by adding waste carbon fiber composite material. Their recycling method, described in the March issue of the Journal of Materials in Civil Engineering, doesn’t require using much energy or chemicals — a critical factor for recycling waste materials. Unlike the impermeable pavement that is used for most roads and parking lots, pervious concrete allows rainwater to freely drain and seep into the ground underneath. Because of increasing concerns about flooding in urban areas and requirements for controlling stormwater run-off, several cities have tried using the pervious concrete in parking lots and low-traffic streets. But because it is highly porous, it is not as durable as the traditional concrete that is used on major roads. Carbon fiber composites, meanwhile, have become increasingly popular in numerous industries. Super light and strong, the material is used in everything from airplane wings to wind turbines and cars. While the market is growing about 10 percent per year, however, industries have not figured out a way to easily recycle their waste, which is as much as 30 percent of the material used in production. Led by Karl Englund, associate research professor, and Somayeh Nassiri, assistant professor in the Department of Civil and Environmental Engineering, the researchers added carbon fiber composite scrap that they received from Boeing manufacturing facilities to their pervious concrete mix. They used mechanical milling to refine the composite pieces to the ideal sizes and shapes. The added material greatly increased both the durability and strength of pervious concrete. “In terms of bending strength, we got really good results — as high as traditional concrete, and it still drains really quickly,” said Nassiri. The researchers used inexpensive milling techniques instead of heat or chemicals to create a reinforcing element from the waste carbon fiber composites. They maintained and made use of the original strength of the composites by keeping them in their cured composite form. Their mix also required using a lot of the composite material, which would be ideal for waste producers. The composite materials were dispersed throughout the pavement mix to provide uniform strength. While they have shown the material works at the laboratory scale, the researchers are beginning to conduct real-world tests on pavement applications. They are also working with industry to begin developing a supply chain. The research for this project was made possible through a partnership with the Boeing Company.